Saturday - breakfast in bed, gymnastics, out to Brewer's Art with friends (and too much wine). 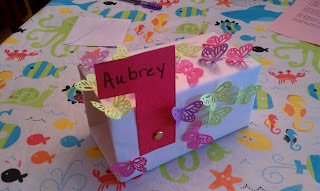 Sunday - Making Valentine's for Aubrey's school, getting ready for Super Bowl Party (and a very strong margarita)! Bake at 350 for 45 minutes, serve with tortilla chips. And I made Sea Glass Candy - very fun and easy!